People should have their blood pressure measured in both arms because having a large difference between the right and left could point to a higher risk of life-threatening vascular disease, British doctors say. People should have their blood pressure measured in both arms because having a large difference between the right and left could signal an increased risk of life-threatening vascular disease, British doctors say. In Monday's issue of the medical journal the Lancet, researchers reviewed 28 papers on the difference in blood pressure between arms. Peripheral vascular disease – 2.5 times increased risk of narrowing and hardening of the arteries that supply blood to the legs and feet. 1.6 times increased risk of cerebrovascular disease that affects the blood supply to the brain that can lead to a type of dementia. 1.7 times increased risk of death from cardiovascular disease. It's important to detect peripheral vascular disease early because there are ways to reduce the risk, such as by quitting smoking, lowering blood pressure or taking cholesterol-lowering statins, Dr. Christopher Clark of the University of Exeter and his co-authors said. Most cases of the disease show no symptoms. The gold-standard approach to identifying it involves comparing the blood pressure in the ankle to blood pressure in the arm — a technique that isn't routinely done. That's where the arm difference could come in, Clark's team proposed. Since the arm with the higher pressure can vary, it's the difference between the arm that mattered, not which arm was higher, they said. "In conclusion, our findings suggest that a difference in systolic blood pressure of 10 mm Hg or more or 15 mm Hg or more between arms could identify patients at high risk of asymptomatic peripheral vascular disease and mortality who might benefit from further assessment," the study's authors concluded. International hypertension guidelines have recommended that doctors measure blood pressure in both arms for years, but the justification has been poor and it’s rarely been adopted, Dr. Richard McManus of the University of Oxford and Jonathan Mant of University of Cambridge said in a journal commentary accompanying the study. "Ascertainment of differences should become part of routine care, as opposed to a guideline recommendation that is mostly ignored," the editorial concluded. 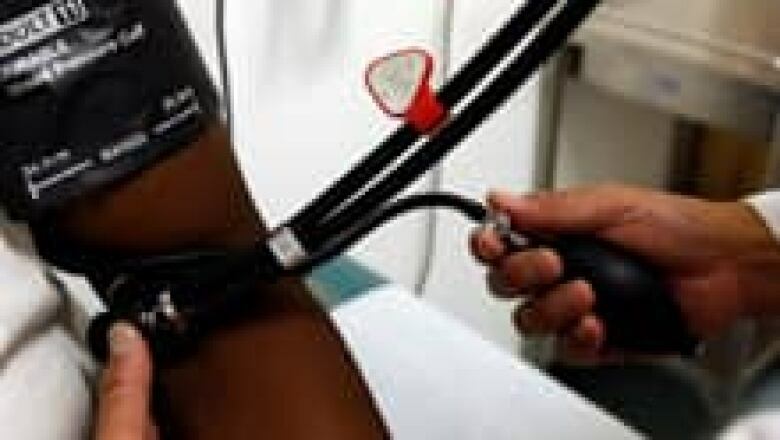 The review's findings strengthen the current Canadian recommendation for physicians to measure blood pressure in both arms on at least one visit, the Heart and Stroke Foundation said. Before recommending that every patient have both arms measured at every visit, a study needs to show that the extra measurements make a difference, the group added.